We've recently discovered the amazing benefits of Irish Moss. It's actually a type of seaweed, and it's so potent and nourishing that during the great potato famine of the mid-19th century, the people of Ireland were able to survive by eating it. 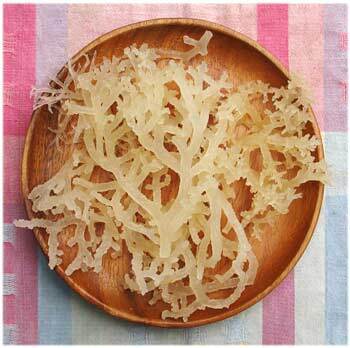 Irish moss is said to contain 15 of the 18 vital elements needed to support human life. It's rich in polysaccharides, proteins, amino acids, iodine, and bromine, with healing properties that affect the respiratory and digestive systems, the skin, and more. After soaking for two days, the flavor becomes quite mild. It can then be eaten as is, pickled and enjoyed in salads or wraps (it's substantial texture works well with these foods), or blended into a puree which is then added to smoothies or soups. I crave it, and we eat it often. Begin by rinsing very well to remove excess salt and sand. Don't be put off by it's texture. Soon it will plump up and lose the seaweed smell. Put into a large bowl and cover with water. Rinse twice daily, rubbing vigorously between palms. (Irish Moss is so strong, rubbing won't hurt it at all.) Remove any bits of debris. Soak for 36-48 hours. Once reconstituted and softened, place in a glass container covered with pure water. Store in the fridge for future use. Change water every couple of days—it lasts for up to three weeks. Give Irish Moss a final rinse, and drain. Add vinegar and let sit for 15-30 minutes, mixing several times. Add oil, optional garlic, and salt. Serve with salads, or wraps. Our favorite Irish Moss comes from Natural Zing. Once soaked, this 8 ounce package quadruples in size. There is a place where we are already healed and whole. It lives in the world of our dreams, whose borders cross into and beyond this realm of existence, and resonates with all that is good and sacred. The body moves naturally towards this state of being. The mind and emotions are drawn to it. This is a place of love, a place of aliveness, where we feel a desire to express life completely. 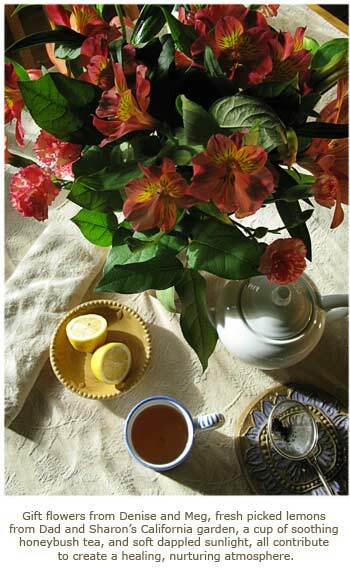 Our diet and lifestyle continue to bring us closer to the ideal state of total health. Healing energy moves from the inside out, from our deepest core, radiating out, touching and filling every aspect of our lives holistically. Foods like Irish Moss bring nutrient-dense grounding stability that supports our bodies in our ongoing quest. Rex and I have come to learn that each and every one of us faces some kind of challenge, and at times, adversity. Not letting these challenges stop us from moving forward helps us to build more strength and spiritual stamina. Through these times we learn and grow, and suddenly find ourselves in a new and wondrous world where love abides in the healing center of our hearts, where dreams of healing have fully entered and are now manifested.